My children have been having fun looking at all of the toys in the "Black Friday" ads and Christmas catalogs. While browsing, my daughter pointed out a toy that she wanted, and excitedly told me that we should get it "because it only cost 99 cents" (it actually cost $99 - BIG difference). I realized that this would be a perfect opportunity to teach the "value of a dollar" and created an activity to make use of all those ads. First, from the catalog, we cut out a variety of pictures of toys (making sure to leave the dollar amount on the cut out piece). Next, we divided a large sheet of paper (taken from our easel roll) into sections and labeled them in $10 increments ($1-10, $11 - 20, $21 - 30 etc.). Finally, I would have her pick out a toy cut out, identify the cost of the item, then tape the cut out in the appropriate category. My favorite part of the activity was hearing her announce, "wow this costs 46 bucks!" - and knowing that she realized this was a lot more than she had in her piggy bank. As much as I love the convenience of swiping a plastic card through a machine, I also realize that this practice may inconvenience our children into having an unrealistic view of where money comes from and how much we spend. I thought this activity gave us a good start on learning more about the value of money, and motivated me find more activities to teach about this. How have you taught your children about the value of money? what a great idea! my girls have been collecting & clipping from all the ads too - love this activity to help them realize just how much things cost. That's an AWESOME idea! 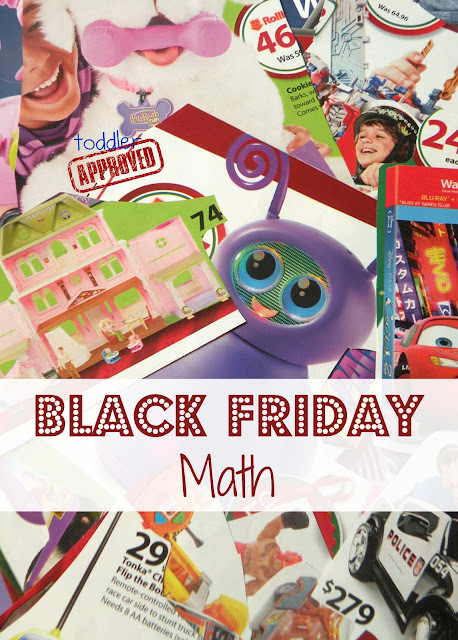 My daughter has been interested in money math lately, so we're definitely going to try this project soon--thank goodness we keep getting all those Christmas catalogs in the mail! Oh yeah! What a great way to get the kids involved in Mom's Shopping not just for black friday. It makes them feel like they are really shopping. I love it! Thanks for sharing! Hope to see you at Mom's Library.